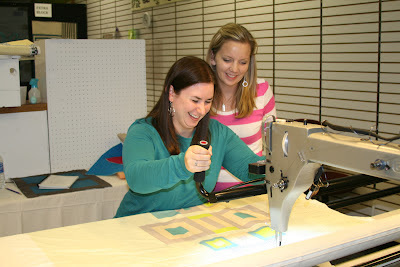 I shared some pictures from the trunk show Angela Walters gave the BMQG this weekend yesterday. 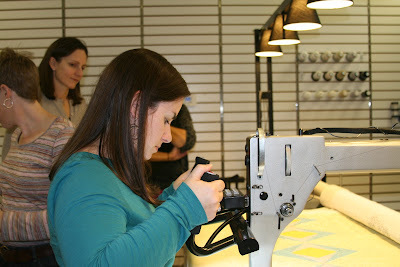 Right after the trunk show, I got to take a class with Angela and learned all about machine quilting the modern quilt. Quilter's Way recently moved into a new space and added a long arm to their store. As a result, this class was all on the long arm. I've rented a long arm a couple of times, but my technique on one is not near as good as it is on a domestic. There was a bit of a learning curve for me in adjusting to the long arm, but conceptually, i think I was able to grasp everything. 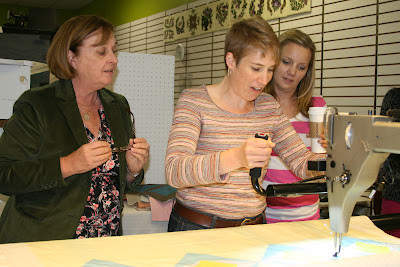 There were five of us in the class and we all took turns using the long arm to try different designs and techniques. We started with pebbles, something that I'm fairly familiar with. One of the great things with Angela's class is that she shows you three different ways to do a certain technique, increasing in difficulty. I think my pebbles turned out pretty good given that I hadn't been on a long arm in a few years. We then moved onto swirls. 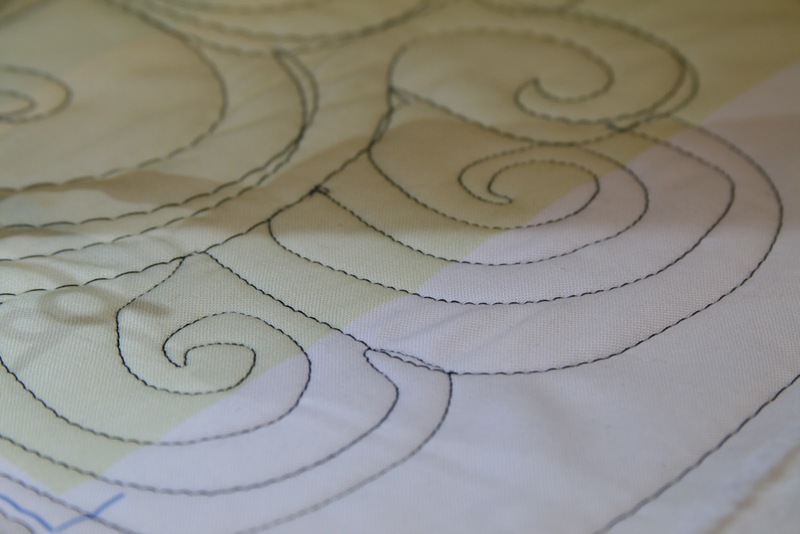 Swirls are one pattern that I have struggled with in the past. I struggle with the spacing at times. I found getting spacing down even more difficult on a long arm, but overall, I think I did pretty good. 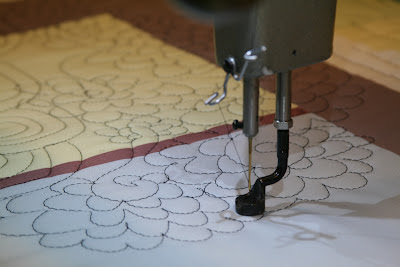 Of course, I had to try one of the more difficult patterns here, not the simplest one. But hey, that's just who I am. Give me a challenge and I'll usually accept it. 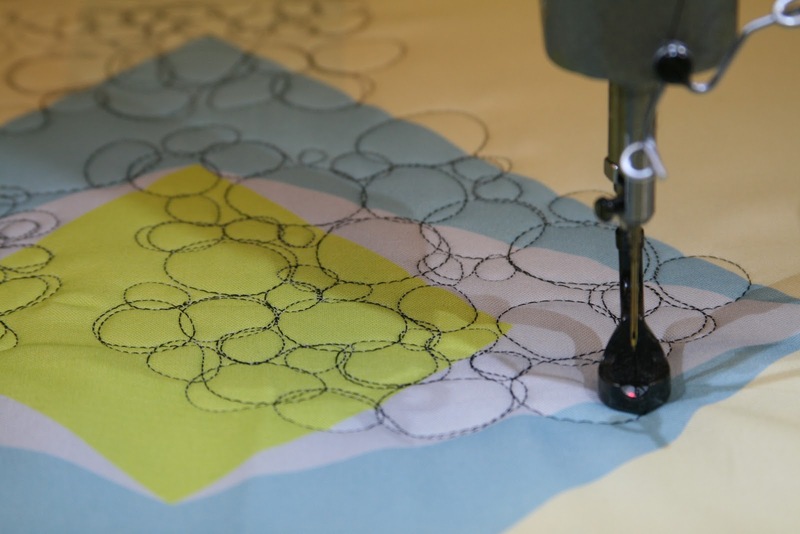 I did, however, think I did a pretty good job at the next pattern. 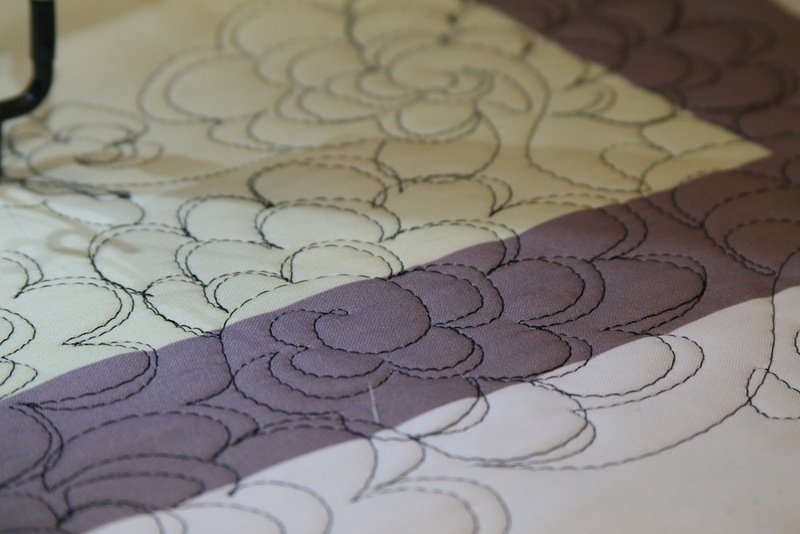 I could certainly see myself doing this quilting design on a quilt. I'm actually thinking it might be good on a one block wonder top I've had sitting around for what seems like forever. I also really enjoyed, and thought I did good on the more difficult version as well. What do you think? Pretty good, eh? 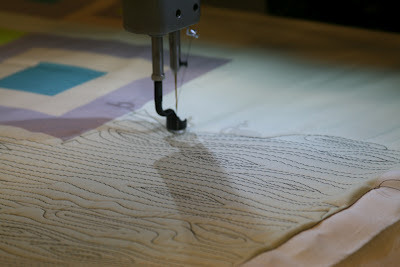 I also really enjoyed quilting a wood grain pattern. The bit that I did is in the middle of the picture with the more pointed knots in the wood. Again, not bad, eh? I could see myself easily doing this one again. 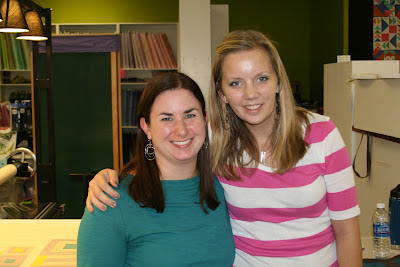 By the end of the day Angela and I were like new best friends. She's actually thinking that if she has another baby, and it's a girl, she just might name it Jen. (Just Kidding) A couple of us from the BMQG went out to dinner with her at one of my favorite tapas restaurants in Waltham and had a great time. I feel like I have a new friend in the quilting community after spending so much time together (and no, I'm not a stalker). If you ever have a change to take a class with Angela, I'd highly recommend it. She's a great teacher that simplifies machine quilting for the average quilter.